DeskCycle Desk Exercise Bike 1 & 2 Review Includes Video! Many of us spend way to much time sitting down, whether it be watching tv, sitting at a desk at work or at home on a PC, either way, we are not doing our bodies any favors spending this much time on our butts. Wouldn’t it be nice to exercise and lose some of those unwanted calories whilst sitting? Yes, well that’s where the DeskCycle Desk Exerciser Bike can help. Designed to fit under most desks this mini pedal exerciser can help you exercise even whilst sitting down, you can even use the DeskCycle laying down if you like, at a height of 10″ the low profile design of the DeskCycle enables it to fit under most home and work desks. Ok, no-one’s saying you’re going to lose as many calories as running or using a regular bike, but this thing really will help you lose some weight if you use it a few hours a day. Proven to lose around 110 calories an hour cycled at a medium pace, about the same as going for a 1 mile walk, the DeskCycle can help you shift a couple of hundred calories a day, which can really add up, 2 hours, 5 x a week that’s a whopping 1000 calories a week. The key to the low profile design of this excellent pedal exerciser is the pedal length because the pedal length is so short it allows the maximum height of the bike to be as little as 10″. What’s so great about a 10″ pedal height? Firstly, a 10″ pedal height is the lowest of all desk cycles and most importantly this low profile design will allow the bike to fit under desks as low as 27″, there’s not many if any, mini exercisers that claim that. Personally, I prefer a heavy, stable machine but a heavier exerciser is not so great for people who are unwell or recovering from injury, the size and weight of the bike can prove to be quite cumbersome for older folk to move and store. 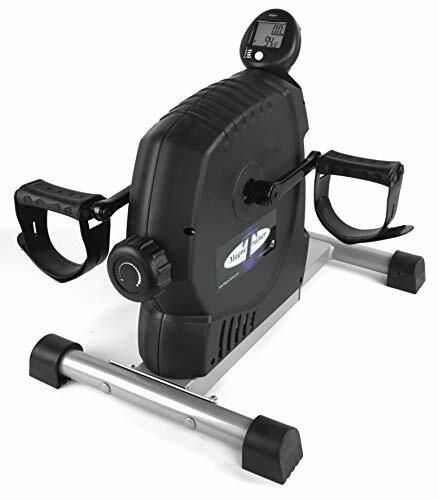 If you are after a stable, light mini bike check out our Vive Pedal Exerciser Review, a great low impact choice for older folk/rehabilitation and beginners. A few of these mini pedal exercisers can be tricky to assemble, but you’ll be happy to hear the DeskCycle is a cinch to assemble, all you’ll have to do is attach the front and rear stabilizers and thread the pedals, no longer than 10 mins for a simple job. A fully illustrated step by step guide is provided with the bike. Having a large number of resistance levels to choose from adds to the versatility of this machine, not only does a choice of resistance help the beginner, but it will also help many people who want to set goals. As you progress and get stronger you can start to increase your resistance and duration of time spent on the bike, burning more calories as you get stronger. You will not find this many levels of resistance on the cheaper models, but whilst it’s great this bike has been designed for beginners and advanced users, be aware it might be a good idea to only use the higher settings when at home as the higher the setting the more you will need to put your body into the workout, which will distract you from your work. For work, a gentle approach is advised, settings 2-3 on the DeskCycle. Designed not to be heard by your co-workers, the DeskCycle has a test result of “45db at 22mph” says workwhilewalking.com, the magnetic resistance makes the cycle smooth and silent. I think it’s worth giving the DeskCycle 2 a quick mention, whilst there’s not a huge difference between the two pedal exercisers, there are a couple of important differences. 1. Adjustable pedal height, this will not be important to everyone, but it may be a very important feature for taller people or anyone wishing to have a little bit extra room for their knees. The desk cycle 2 gives the user the option to adjust the pedal height from 10″ to 9″, very handy if you’re taking the bike to work or you have a low desk at home. As I mentioned taller people will get the most use from this new feature, if you’re buying this to use just for tv watching then no need to pay the extra few $’s for a 2. 2. Improved Visual Display – How have they improved it? Simple, it’s a bit bigger, and offers a couple more features like a 160 activity tracker compared to the DeskCycle 16-hour tracker, having a larger display is always handy but not essential. As you can see they haven’t changed much with the 2nd version of the DeskCycle but the adjustable pedal height is certainly a cool useful feature. You will be hard pushed to find a mini exerciser that can match the versatility, durability, and stability of the DeskCycle, but if you haven’t quite made your mind up yet it might be worth taking a quick look at our comparison table and summary of the other two top exercisers in this category. With more than twice the resistance range of the other budget magnetic exercisers, the Magne trainer offers just as many resistance settings as the DeskCycle. And this bike is also very sturdy, built onto a solid steel base the Magne is supported by two 15″ stabilizing feet, with all four corners of the stabilizers capped with anti-slip rubber to stop the bike from sliding on hard floors. This mini exerciser has always been a very highly rated machine, consistently receiving some of the highest ratings for any mini exerciser on Amazon. The Magne is an excellent exerciser for home use, hospitals, etc. Actually, it’s probably the best machine other than the DeskCycle for home use, but as soon as you want to use this thing under a desk you’re going to hit some problems. It has a height of 15″ so any desk of normal height will not accommodate a full range of motion using this bike, which will limit its uses somewhat. If you need a top of the range durable extremely versatile machine for home use and recovery, then this is the best out there, but if you want something you can take to work and use at home then the DeskCycle is probably a much safer bet. The Sunny Health mini exerciser offers everything you need from a home mini bike for under $100, we had to put this mini exerciser in the review as it is a mini bike that stands out from the rest! Extremely well built, the Sunny Health exerciser offers a truly versatile experience with 8 resistance settings, which is fantastic for a bike at this price point. It also has a nice large LCD display which will provide you with info on calories burnt, time spent exercising, and distance traveled. Again another mini bike that disappoints when it comes to height, with a height of 14″ you will still struggle to see this bike fit under most normally sized desks. 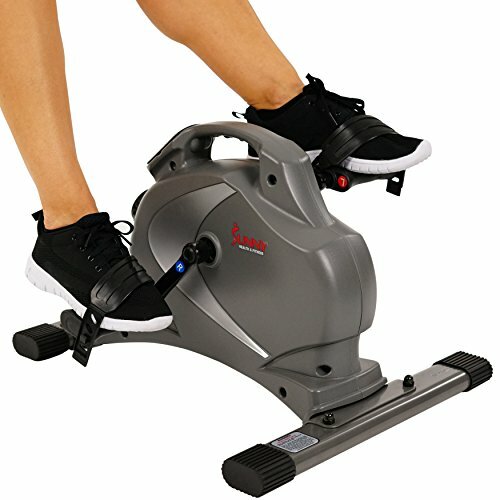 Unless you raise the height of your desk this bike will be restricted to home use, but if you have been looking for a sturdy, well-built versatile machine for a low impact upper and lower body workout for under a $100, you won’t find any better than the Sunny Health Fitness mini exerciser. 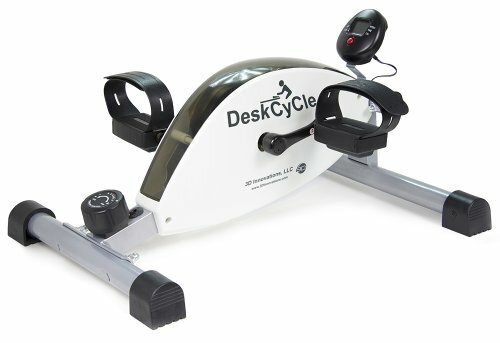 Summary ,The DeskCycle is the best mini bike available to fit under a desk, with its low profile 10" design it is unmatched by any other mini exerciser on the market, and with the DeskCycle 2 adjustable pedals which allow the pedals to lower to 9", I can see this bike being unbeatable for the near future. Excellent build quality, durable and versatile, this awesome mini bike from 3D innovations shouldn't disappoint.